The Immigration Minister, Peter Dutton, made headlines in mid-January threatening to send 72 children back to Nauru. 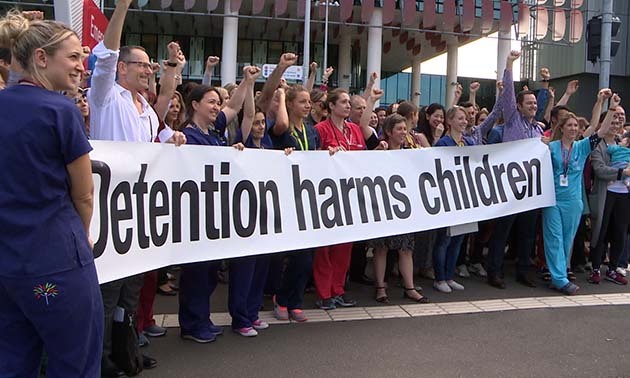 The children are among the 260 asylum seekers and refugees who have been brought from Nauru and Manus for medical reasons. Dutton’s threat comes just weeks before the High Court of Australia is likely to rule on whether it is constitutional for Australia to maintain offshore detention centres. Dutton’s announcement makes it very clear that if the government wins the High Court case, it intends to return the 260 covered by the court case to Nauru and Manus Island. Yet the conditions on Nauru and Manus Island continue to spiral downwards. Even at a basic health level, Nauru can’t cope. About the same time as Dutton was saying people would be sent back to Nauru, around 25 people were taken from Nauru to Port Moresby for medical treatment. In spite of the government’s ruling that no-one is to be brought to Australia, at least one refugee from Nauru was so sick they were brought here. It is not going to get any better. The Nauru hospital often runs out of basic medical supplies, while creeping skin rashes and sores due to the heat and humidity run rampant. Even worse, there is no resettlement and no future on Nauru, and detention times are blowing out. The absolute refusal of the Australian government to allow any of the offshore refugees to be resettled in Australia has resulted in some advocates focussing on possible third country resettlement. Refugees on Nauru recently signed letters sent to the New Zealand government and now to Malcolm Turnbull seeking resettlement in New Zealand. The request to New Zealand was based on a three-year old “agreement” between then Labor Prime Minister, Julia Gillard and New Zealand Prime Minister, John Key to take 150 refugees from Australian detention centres. But that agreement came from a different period, and it has never been acted on. In March, 2013, when Gillard struck that agreement, Australia was willing to resettle people they sent to Nauru who were found to be refugees. That all changed when Rudd became Prime Minister and ruled that anyone arriving after 19 July 2013 would never come to Australia. When Tony Abbott became prime minister shortly afterwards, in September 2013, he quickly repudiated the agreement with New Zealand. For its part, New Zealand works hand in glove with Australia and is complicit in the abuse of asylum seekers. It has used Australia to intercept, and turn around boats that were attempting to get to New Zealand. It has also introduced its own draconian legislation against boat arrivals and keeps its annual resettlement quota at a paltry 750. Now Turnbull has made it clear that there won’t be any special arrangement with New Zealand. The reason is obvious. If asylum seekers arriving by boat in Australia can get resettled in New Zealand, even if it is via Manus or Nauru, then it risks restarting the boats from Indonesia. Turnbull is not going to chance that. But he does have a problem. As the situation deteriorates, as detention gets longer, as the news of scale of sexual assault becomes more known, there is increasing pressure on the government to find a solution. Hypocritically, the Labor Party has even been critical of the government for not finding a third country. But the UNHCR has refused to sanction or cooperate with Australia’s offshore processing regime. All the other resettling countries that have relations with the UNHCR rightly regard the refugees on Manus and Nauru as being Australia’s responsibility. They aren’t about to agree to take refugees that Australia has refused. That is why Australia has gone (unsuccessfully) to Cambodia, The Philippines and Kyrgyzstan to try to bribe them to accept refugees. The refugee movement needs to keep the focus on resettlement in Australia. The pressure on the government is building and there are cracks. Mass outrage brought the pregnant Somali refugee, Abyan, to Australia. After separating them for six months, the government finally brought the family of a young Iranian asylum seeker brutally raped on Nauru to join her in Australia. The Australian High Court decision is expected in February. If the government wins that case, we need to do everything we can to prevent them from sending anyone back—with emails, petitions, demonstrations, and blockades. This will be the next battle to push back against the government policy and win resettlement for all those stuck in the offshore hell-holes.